Beat the egg whites and salt to soft peaks using an electric mixer. Meanwhile, in a medium saucepan, bring sugar, tangerine and water to a boil, stirring occasionally. Continue to boil until it reaches soft ball stage (when a drop of the syrup forms a soft ball when dropped in cool water)while continuing to stir occasionally. Strain out the tangerine slices (and zest). Keep the mixer running (you need a stand mixer or a friend to complete this next step) while you pour a continuous stream of the molten syrup into the egg whites. Continue to beat for about 5 minutes or until the frosting is fluffy, glossy and cool. Allow the tangerine slices to cool and harden on a wire rack. Frost cooled cupcakes, top with tangerine slices. *If your icing isn't very orange, you can add a drop or two of food coloring to help it along. I love this icing because it bursting with tangerine flavor. I also love it because while you make the syrup for the icing you are also candying the tangerine slices for the garnish. The slices help flavor the syrup and give it a faint orange tint. Tangerines also candy well, the skin is relatively thin and the pith is less bitter than other citrus fruits. 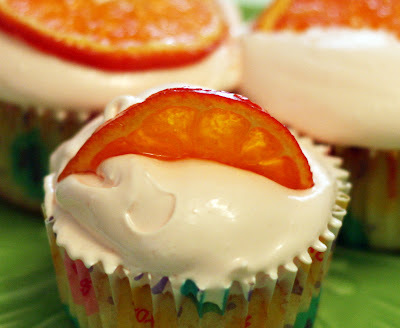 Great on tangerine cupcakes.